Trends aren’t usually something that I ascribe to, particularly when it comes to fashion. But when it comes to food and nutrition, I usually pay attention. Every year, nutrition experts and journalist publish the forecasted “foods to eat,” and this year is no exception. Now that we’re into a brand new year, it’s a good time to think about your food choices: Maybe it’s time to shake things up a bit and try something new. Or maybe you’re ready to take your eating plan to the next level. Or maybe you’re just curious to learn about what’s new. Whatever the case, here are a few food trends to look forward to in 2016. Egg muffins. No, not “Egg McMuffins.” Dust off your muffin tins, because egg muffins are in! Eggs are a nutritious food, especially for people who have diabetes. They’ve got protein to help maintain lean body mass, curb appetite, and help with blood sugar control. Eggs also contain vitamins A and D and choline. And now that the new Dietary Guidelines have declared cholesterol to no longer be a “nutrient of concern,” you can hopefully feel more comfortable about including them more often in your eating plan. But if hard-boiled bores you, why not try egg “muffins?” They’re super easy to make; you can add all types of ingredients, like vegetables and legumes; they’re quick and convenient; and they’re tasty, too. Check out this recipe to get you started. Pulses. What are pulses, you ask? Pulses are nothing new, and you’ve probably been eating them all along. Pulses are the dried seeds of legumes — beans, peas, and lentils, to be more exact. Pulses are so popular that the United Nations has declared that 2016 is the International Year of Pulses, so you don’t want to miss out. Pulses may seem anything but exciting, but behind that humble façade is a superfood, especially for those with diabetes. Like eggs, pulses are packed with protein (albeit, plant protein), along with fiber and plenty of vitamins and minerals. Regularly eating pulses can help with lowering cholesterol and blood pressure, evening out blood sugars, and weight loss. Another high point: Pulses are very inexpensive, especially compared to animal protein. Dried beans, peas, and lentils are cheaper (and lower in sodium) than canned varieties; however, if you don’t have time to soak and cook them, the canned versions will do just fine (give them a good rinsing to decrease the sodium). Need an idea for how to prepare pulses? Try this tasty recipe. Spiralized veggies. We all know that should eat more vegetables. And some people who have diabetes shy away from pasta and noodles due to their heavy carb content. 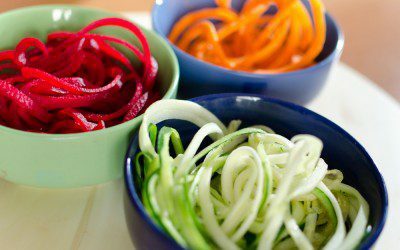 Now we can have both, thanks to the vegetable “spiralizer.” Yup, one of the trendy new kitchen gadgets that has taken off is the spiralizer. This device churns out curly ribbons of vegetables, making noodles, or, rather, “zoodles,” from zucchini, carrots, beets, broccoli, and more. Use zoodles in place of pasta for a healthy, low-carb meal. Add zoodles to salads, stir-fries, or any dish in which you’d use vegetables. It’s a fun twist on veggies and can maybe make you more interested in boosting your intake. Click here to learn more. Meal delivery services. No time to cook but tired of take-out? You might consider a meal kit from a meal delivery service. These services have sprung up all over, and many offer meals for various types of eating plans, such as Paleo, kosher, and vegetarian. They’re also portion controlled. You can also choose a subscription service that provides food for two people or an entire family. Available meal delivery services are regional, so do some research to see what’s offered in your community. Popular services include Blue Apron, HelloFresh, and Plated. Be prepared, however, to cook your meal (which still takes time) and open your wallet (yes, you pay for all the prep-work and convenience). Still, for many people who are trying to eat more healthfully, meal delivery services may be a good decision. Sprouted grains. I wrote about sprouted grains back in December and they’re definitely “in” for 2016. Sprouted grains are grains (wheat, rice, and barley, for example) that literally have started to sprout. 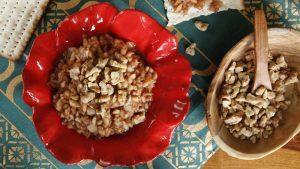 It’s believed that these grains are more easily digested; they also contain higher amounts of some vitamins and may be better for blood sugar control. Look for sprouted grain products in your local supermarket and learn how to sprout your own grains here. What factors should you take into account when navigating the produce aisle in the supermarket? Bookmark DiabetesSelfManagement.com and tune in tomorrow to find out from registered dietitian Regina Shirley!